On Monday, February 4, 2019, Lyle Desmond Nish, passed away peacefully at the age of 85. He was a loving father, grandfather, and great-grandfather. Lyle was born April 9, 1933, in Pocatello Idaho to Leslie R. and Dorothy M. Nish. He was their only child. 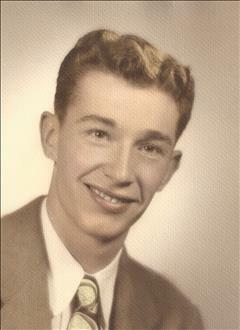 Lyle lived in Pocatello throughout his life where he graduated from Pocatello High School in 1951. He enlisted in the U.S. Navy, serving his country on the USS Stembel as a boiler operator until his honorable discharge in 1962. Lyle made his career as a machinist for the Union Pacific Railroad from 1951 to 1995, retiring as wheel shop foreman. His railroad career afforded him many fond memories, valuable friendships, and wonderful stories that he loved to share with his family. Following retirement, Lyle enjoyed traveling with friends through several of his favorite national parks. He loved spending time in his yard, making it beautiful. He was generous in sharing his garden tomatoes with family, neighbors, and friends. His carefully attended roses were also greatly admired. Always by his side were his beloved dogs. His family will miss his entertaining stories and humor. He was a democrat through and through and loved to discuss politics with anyone who would listen. Lyle is survived by his two daughters, Lesli Jardine, and JoLynn Sorensen (Val). He also leaves behind five grandchildren, their spouses, and eleven great-grandchildren. A viewing will be held Saturday, February 9, from 11:30 a.m. to 12:30 p.m. at Cornelison Funeral Home, 431 North 15th Avenue. A private family service with military honors will be held following the viewing at Mountain View Cemetery.